Pope Leo VIII (died 1 March 965) was Pope from 23 June 964 to his death in 965; before that, he was an antipope from 963 to 964, in opposition to Pope John XII and Pope Benedict V. An appointee of the Holy Roman Emperor, Otto I, his pontificate occurred during the period known as the Saeculum obscurum. Born in Rome in the region around the Clivus Argentarius, Leo was the son of John who held the office of Protonotary, and a member of an illustrious noble family. Although a layperson, he was the protoscriniarius (or superintendent of the Roman public schools for scribes) in the papal court during the pontificate of John XII. In 963 he was included in a party that was sent by John to the Holy Roman Emperor, Otto I, who was besieging the King of Italy, Berengar II at the castle of St. Leo in Umbria. His instructions were to reassure the emperor that the pope was determined to correct the abuses of the papal court, as well as protesting about Otto’s actions in demanding that cities in the Papal States take an oath of fidelity to the emperor instead of the pope. 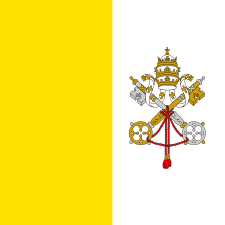 By the time Otto entered Rome to depose John, Leo had been appointed Protonotary to the Apostolic See. A synod convened by the emperor uncanonically deposed John (who had fled to Tibur) and proceeded to elect Leo, who was the emperor’s nominee, as pope on 4 December 963, although as he was still a layman such an election was also invalid. In the space of a day Leo was ordained Ostiarius, Lector, Acolyte, Subdeacon, Deacon and Priest by Sico, the cardinal-bishop of Ostia, who then proceeded to consecrate him as Bishop of Rome on 6 December 963. The deposed John however still had a large body of sympathisers within Rome; he offered large bribes to the Roman nobility if they would rise up and overthrow Otto and kill Leo, and so in early January 964, the Roman people staged an uprising that was quickly put down by Otto’s troops. Leo, hoping to reach out to the Roman nobility, persuaded Otto to release the hostages he had taken from the leading Roman families in exchange for their continued good behaviour. However, once Otto left Rome in around 12 January 964, the Romans again rebelled, and caused Leo to flee Rome and take refuge with Otto sometime in February 964. John XII returned and in February convened a synod which in turn deposed Leo on 26 February 964, with John excommunicating Leo in the process. Leo remained with Otto, and with the death of John XII in May 964, the Romans elected Pope Benedict V. Otto proceeded to besiege Rome, taking Leo with him, and when the Romans eventually surrendered to Otto, Leo was reinstalled in the Lateran Palace as pope. Together with Benedict’s clerical and lay supporters, and clad in his pontifical robes, the former Pope was then brought before Leo, who asked him how Benedict dared to assume the chair of Saint Peter while he was still alive. Benedict responded “If I have sinned, have mercy on me.” Having received a promise from the emperor that his life would be spared if he submitted, Benedict threw himself at Leo’s feet and acknowledged his guilt. Brought before a synod convened by Leo, Benedict’s ordination as Bishop was revoked, his pallium was torn from him, and his pastoral staff was broken over him by Leo. However, through the intercession of Otto, Benedict was allowed to retain the rank of deacon. Then, after having the Roman nobility swear an oath over the Tomb of Saint Peter to obey and be faithful to Leo, Otto departed Rome in late June 964. Having been cowed by Otto, the remainder of Leo’s pontificate was reasonably trouble free. He issued numerous bulls, many of which detailed the granting of privileges to Otto and his successors. 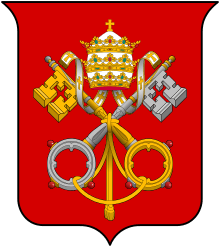 Some of the bulls were alleged to grant the German emperors the right of choosing their successors in the Kingdom of Italy, the right to nominate the Pope, and all popes, archbishops and bishops were to receive investiture from the emperor. In addition, Leo is also claimed to have relinquished to Otto all the territory of the Papal States that had been granted to the Apostolic See by Pepin the Short and Charlemagne. Although it is certain that Leo granted various concessions to his imperial patron, it is now believed that the "investiture" bulls associated with Leo were, if not completely fabricated during the Investiture Controversy, at the very least so tampered with that it is now largely impossible to reconstruct them in their original form. Leo VIII died on 1 March 965, and was succeeded by Pope John XIII. According to the Liber Pontificalis he was described as venerable, energetic and honourable. He had a number of streets dedicated to him in and around the Clivus Argentarius, including the descensus Leonis Prothi. 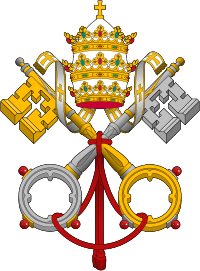 Due to Leo’s uncanonical election, it is now accepted that until the deposition of Benedict V, he was almost certainly an antipope. Further, although the deposition of John XII was invalid, the election of Benedict V certainly was canonical. However, if Liutprand of Cremona (who chronicled the events of this period) can be relied upon, if, as he wrote, Benedict did acquiesce to his deposition, and if as seems certain, no further protest was made against Leo's position, it has been the consensus of historians that he may be regarded as a true pope from July 964, to his death in 965. The fact that the next pope to assume the name Leo was consecrated Leo IX also seems to indicate that he is a true pope. ↑ Richard P. McBrien, Lives of the Popes: The Pontiffs from St. Peter to Benedict XVI, (HarperCollins, 2000), 159.